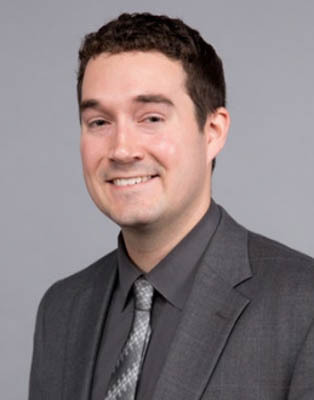 As a crisis-management lead for the company, Ron Hawks ’12 organized the defense contractor’s response in Puerto Rico to Hurricane Maria last year – and his time at UCF prepared him to do it. Forty horses. Sixteen cars. One commercial airplane. What do these things all have in common? 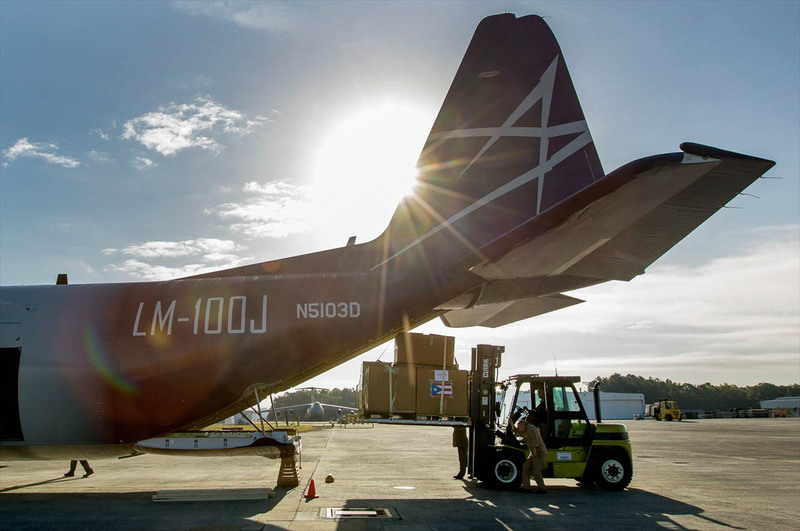 They each weigh roughly 80,000 pounds, the amount of relief supplies Lockheed Martin’s crisis-management lead Ron Hawks ’12 helped a team to collect, organize and deliver to Puerto Rico last year after it was severely damaged by Hurricane Maria. One year ago on Sept. 20, the storm made landfall on the island and is estimated to have caused $90 billion in destruction to the U.S. territory. It took about two weeks to successfully complete the mission, but Hawks and his team spent the entire time trying to reach their contacts on the island via satellite phones, coordinating with companies to get items such as generators and cases of water, and finding the right aircraft and delivery location, among hundreds of other tasks. “It was probably one of the most challenging situations that I may face in my entire career,” Hawks says. Although it was difficult, Hawks says he was able to conquer the challenge because of his experience at the university. Ron Hawks ’12 says he’s always had a passion for helping others and his position as a crisis management lead allows him to fulfill it. As a criminal-justice major and emergency-management and homeland-security minor, Hawks interned at the Central Florida Intelligence Exchange, a crime and hazard fusion center that supports nine Central Florida counties. After graduation, he landed a job with Lockheed in a crisis-management position. His job is to make sure company personnel and sites are prepared for natural and man-made disasters, as well as lead a team in functions such as human resources, technology, security and more in recovery efforts. About a year ago, Hawks’s undergraduate internship experiences proved to be helpful once again when he was tasked with managing the storm response for Lockheed’s Puerto Rico site, which employed more than 150 people at the time. The site’s location in the western city of Aguadilla added another level of difficulty to the already daunting delivery. Most of the flights and supplies to Puerto Rico arrived in San Juan, located in the east, meaning a trip across the island –with debris-covered roads, no working traffic lights and no power – was needed to reach the right destination. This may sound impossible, but Hawks was able to join a Lockheed corporate aircraft approved to fly into the Aguadilla airport, which was limited to military aircraft right after the storm. One key person Hawks worked with was a contact he made while at UCF. Through separate two trips, Hawks’s team was able to make their deliveries, which helped not only Lockheed employees, but also residents of the city of Aguadilla. While the experience was full of hurdles, Hawks learned a lot from it. Here he shares some of that knowledge, more details about the mission and advice for those looking to enter his industry. 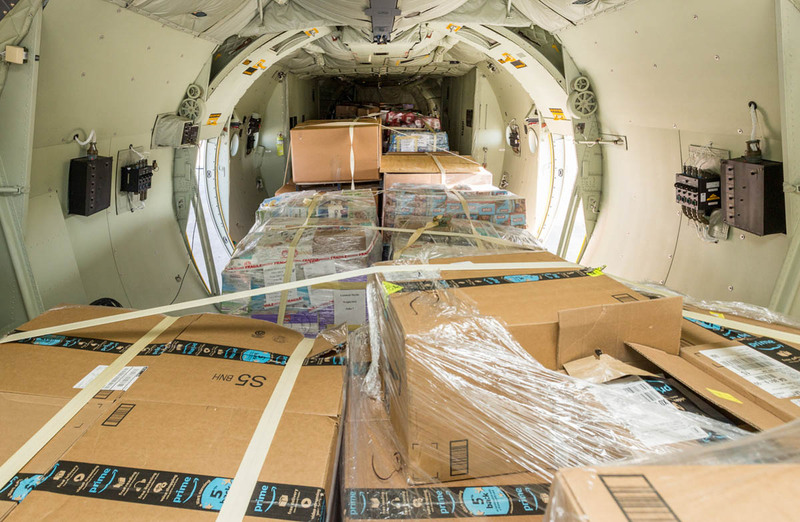 What was the biggest obstacle you faced in delivering supplies to Puerto Rico? Communication was probably one of the hardest obstacles because you’re trying to coordinate not only getting relief supplies there, but what people need. How do we coordinate logistics in moving supplies from the airport to a city that has no form of communications? How do we coordinate logistics in moving supplies from the airport to a city that has no form of communications? Cellphones were out and the batteries in those satellite phones could only last so long [meaning] our phone calls could only be so detailed because of the length. There was also, in some cases, a language barrier. I know a little bit of Spanish, but not enough to be fluent. We verify our employees’ wellbeing after any emergency. With no cellphone coverage, no internet, no email, no anything, frankly, we had no real way of doing that. Eventually [it] got to the point where we were trying to get our employees down there who we had been able to get in contact with to ask others, “Hey we know you live within a few blocks of this employee. Have you seen them? Do you know them?” Things like that. What is the greatest lesson from this experience? [One of] the lessons that I took away from Maria was we have to build relationships and partnerships with our community. Without me being able to reach out to Orlando’s emergency manager, Manny Soto, to get the contacts for the mayor’s office and Aguadilla and [other agencies, we wouldn’t] have that direct line as easily as we could have. And it’s not just that, working with our counterparts that are in the area [is important.] We have other businesses there that we know are just as equally concerned as we are and provide that support [to] help each other. What did it feel like to be able to help out with such a devastating natural disaster? Rewarding is the first thing that comes to mind. I felt super rewarded and satisfied and felt like my entire schooling, going through UCF and going through emergency management, [was worth it.] My passion in life has been trying to help. Knowing how rough it was for them down there and essentially what they had to go through, I was like, “Okay we have to do everything we can.” And the ability for us to help and knowing that Lockheed has come through and said, “Yes, this is the right thing. We need to do it.” It’s super satisfying. What advice would you give to a student looking to get into your field? This fall, UCF just released its new bachelor program in emergency and crisis management, as well as a graduate program in that. I know the level of breadth and experience there from the staff and the individuals that are involved at the emergency management and homeland security functions within the university are top level. And those contacts are frankly what helped get me into a position where I could be successful in my career. There’s also the Emergency Management Student Association. It’s a professional group that brings in emergency mangers, not just from private industry, but also from the public. So you’ll hear from people who run different cities, counties, even at the state level from time to time. Or you also get the individuals who may run hospital chains. The stories that they tell are from events and things that have happened, not just in Central Florida, but across all of the state, even farther. How do you stay calm when managing a crisis? Knowing that there are people in need and people in life-critical situations, you realize that you have to be the calm voice of reason and try to coordinate and work your way through every possible avenue that we can to see what we can do to help others. [But] there’s definitely moments in time where even myself, after [hearing the word] “devastating” and things like that, you need to take a break mentally for yourself to kind of regroup. You have to become a leader because if you show stress or signs of faltering, it’s not going to help the team and it’s not going to be productive. The folks that are in these positions, they’re there for a reason and they’re there to help bring everybody grounded to a level of response and quick action to take immediate actions in those cases to help get things back to normal for those who are impacted.